NGOs and trade unions today (19 May) hit back at accusations they were spreading lies on social media about the Transatlantic Trade and Investment Partnership (TTIP), as it emerged that Brussels Police used controversial “kettling” techniques and water cannon on protestors outside the European Business Summit. Hundreds of anti-TTIP protestors, including a Green member of the Belgian Parliament, were encircled for several hours by riot gear-clad cops before being arrested en masse outside the Egmont Palace in Brussels, using a legal mechanism known as “administrative arrest”. Administrative arrest allows groups of people to be held without charge for up to 12 hours. Shortly after an estimated 250 demonstrators were arrested on Thursday, EU Trade Commissioner Karel De Gucht and US Ambassador to the EU Anthony Gardner accused some protestors of spreading lies during a summit panel about TTIP, a trade deal between the EU and US. 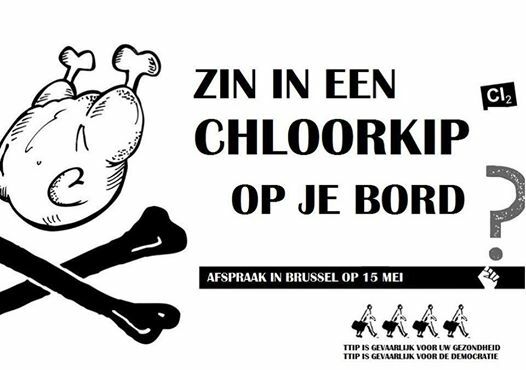 One example cited was that TTIP would mean Europeans being sold US chickens washed in chlorine. This week, EU and US negotiators are meeting in Washington DC for the fifth round of negotiations. They are aiming to agree on a deal by the end of next year. De Gucht said, “You have the campaigns by the social media, groups using the social media, a number of NGOs spreading sometimes, I would say, complete lies, for example on hormone meat. Olivier Hoedeman, research and campaign coordinator of the Corporate Europe Observatory, a pressure group, was one of the demonstrators arrested. TTIP’s critics believe it will lead to a lowering of European standards in areas such as food and climate change, he said. Felipe Van Keirsblick, the secretary general of the Belgian trade union for employees, the CNE-CNG, was among the coalition of farmers, students, NGOs and unions protesting. He said that the TTIP negotiations should be more transparent and questioned Commission figures that state TTIP will lead to a 4% increase in GDP. He said, “De Gucht’s comments about social media show how uncomfortable and unused he is with a truly public debate over this trade deal. “The level of secrecy in the TTIP negotiations is unprecedented,” he added. The Commission has said that the TTIP negotiations are among the most transparent trade deals ever. Protestors were held in the “kettle” for about two hours before their arrest, forced to sit on the ground and placed in plastic handcuffs. At about 12:30 PM, they were bussed to a jail in the Etterbeek district. The last demonstrator was freed without charge at 6 PM. The protest began at 8 AM. Campaigners claimed several protestors had sustained injuries and were sprayed with water cannon. EURACTIV attempted to contact Brussels Police, but has not yet received a response. Kettling is the name given to a police technique where a group of people are surrounded by officers and are prevented from moving from a small area. It has been criticised across Europe and Canada, not least because bystanders are often captured in the cordon. In March 2012, kettling was ruled lawful by the European Court of Human Rights following a legal challenge following its use by London’s Metropolitan Police in May Day protests in 2001. Van Keirsblick said the protests were non-violent but admitted that police told them any attempt to block the entry to the palace was illegal. After an attempt to block the entrance was stopped by a line of about 50 police, about 100 demonstrators began to walk back to the protest’s starting place, outside the Palais de Justice. Hoedeman said at least one bystander uninvolved in the protest was caught in the kettle. Another source told EURACTIV four people uninvolved in the protests were arrested. Additional arrests were made as demonstrators outside the kettle reacted angrily to the arrival of police buses. Protest organisers are now planning an official complaint and a week of further action. The US Mission to the EU underlines that TTIP negotiations "are not a secret", pointing out that the US negotiation objectives were notified to the US Congress and are publicly available. On its website, it does however admit that "a degree of confidentiality" is necessary "until negotiations are concluded" but argues this is standard practice. "After negotiators have concluded negotiations of the agreement, the EU Council plus the directly-elected European Parliament will debate and then approve or reject the agreement – and the US Congress will do the same."